When I first heard the news about hubs move to Seoul was somehow a shock. He did mentioned it a couple of times this year but it was like in a year or two. Now its in a month’s time. What was my first feeling when I heard it? Mixed feelings – numb! Miss the people here and the food and life here but the thought of moving to a foreign place got me kinda excited. The setback is a new place – no relatives really scares me. I have always thought of myself as an adventurous person – I guess I am not that adventurous. Probably if I have no kids then I can be. How do the kids feel? Boy was excited – really excited. Princess was somehow reluctant. Her only comment was “Why do we have to go? I already have friends here”. I feel for her. I know how she’s feeling. Poor girl. We’ve been over there to check out the place. Totally changed me. It didn’t feel that bad after all *fingers crossed*. Now that we’re back here in our home country to prepare for the move – I still feel the heavy heart. Probably its because I have not been away from my family this far. Its just different compared to the time when I was in Perth for my degree. This is a whole new level – a whole new life. I am still pondering on whether this is a good move. I guess I will only find out once we are there! We had dinner a day earlier with my sis and family @ The Caff, Puchong. I swear this would be the last time we will be going there. I saw it in the TV review bout how great the escargots were and believe me – its the most horrible that I’ve tasted in my life. Its not worth the money and the rests of the food tasted ok. I personally think the pizzas are the safest and best to eat. For ratings I would give it a 5 out of 10. Colour experiment that I tried with the camera. Interesting! Coincidentally, we were siting on table # 8 which is also the ‘real’ date of my birthday! The wine rack – we didn’t order even a bottle. Shocking shocking. Appetiser – Escargots: This is supposed to be a famous signature dish (according to the tv). After trying this .. I really don’t know what’s the meaning of a ‘signature dish’ anymore! Smoke Duck Pizza: Totally a disappointment to me. I expected more from this. Chicken Ham Pizza: One of the safest to order! Baked Macaroni: My personal opinion – This is the nicest dish compared to the rests that we order. My favourite shot of the kids – how lovely! And finally the birthday cake from Baskin Robbins! My ‘real’ date falls on a weekday Monday. We took leave and went for 2-marathon movies and dinner @ Genji Hilton PJ with the kids after school. In comparison to the night before, food here was superb. The kids were having fun imitating the chefs. They love looking @ the chefs cook. And when the chefs finish a dish they would clap, indicating to the waiters that the food is ready. Business was great that day. There was a delay in serving. The kids especially Boy acted as assistants to the chef. They had a great laugh on the kids, too. For food ratings – would be 8 out of 10. A black and white shot. Classic. Priceless. Princess enjoying the food …hmmm. I have been thinking about what to get Mom for Christmas. Its always a tough decision when it comes to giving gifts to mom. Since she’s a great cook so I thought – why not get her a new dinnerware set. She always prepare great Christmas dinner with turkey stuffing and all. She would be most grateful. She’s not the kinda person that goes for floral stuff so I think a simple one would be perfect. With nice sumptuous turkey dinner, we must not forget the wine and drinks. Hubs would always bring over 2 bottles of wine and for those who don’t prefer alcohol, we have fresh juices. Pfaltzgraff drinkware is the perfect compliment for the dinnerware set, too that I would be getting for mom. I have gotten ourselves a new dining table. I would need new linens like table cloth, runners and placemats. The kids would be so delighted with the new dining table. Know why? Cos we eat at a small mini coffee table. Since they are much older, we bought a proper dining table for our meals. Year-end is always a joyous season. Its also a time for many celebrations – weddings and moving into a new home. I personally prefer to give dinnerware as gifts. Dinnerware is the perfect gift for a home – be it new or existing homes. Additional collection of nice elegant dinner plates, bowls, mugs and cutlery gives a new look to the kitchen. Having a nice set of dinnerware brings a new touch to the food that’s served. I’m sure that many people wouldn’t mind having new dinnerware as gifts. Probably I would get some as christmas gifts. I got myself some new dinnerware and with these nice new dinnerware comes the planning of gastronomical food and wine. I have always wanted an online business so that I can earn some extra income. I very much believe in video service for business. This way we can reach out to wider audiences and save money on printing costs. I came across this site that does online video for business where users can freely post videos of their business plans. What more? Its more professional plus its environmental-friendly compared to paper advertising. Youtube was launched many many years ago. Sometimes when I tried to upload videos in the site, it takes a very long time to finally post it into the site. Since Youtube is a free service, there are bound to be many people signing up. Why don’t we all save our time and get one video solution for your business? Our 13th year anniversary fell on the 4th October 2009, a Sunday .. that’s 2 months ago. 13 years just went by with a flash. And now we continue of long journey accompanied by a 6yo and a 5yo. Time really flies. We celebrated a day earlier on the 3rd. Dropped the kids off at my sis’s place and stopped at a customised Japanese Restaurant called Aoyama in Sri Hartamas. Why do I say customise? Bcos the food that they serve is not from the menu .. its specially made to the customers’ requirement and each and every dish is taste differently. The taste is simply exquisite. Looking at the pics tells it all …. Before dinner is served … Hubs had this ..
5th dish: Tomato Rice & Saba Fish .. by the time this dish arrived, I was already full. 6th dish: Special Soup with Salmon .. full of taste .. superb! 7th dish: Duck Pate .. after taking this .. I felt like I was getting a heartburn! And finally … dessert – ICE-CREAM .. each of them taste differently – from right: red bean, green tea, rum & raisin and the last one taste like salt .. its sea-salt. After we finished out dinner, I felt I was overdose. Don’t want to see any of these dishes for awhile. Extremely full and thanks Hubs for planning this. Another special dinner. Bill totaling $403.15. Yesterday is our 12th year anniversary. Time seemed to fly by really quickly. As our normal routine, we dropped the kids off at my sis adn headed to Michelangelo’s at Solaris Mont Kiara. After I finished my pasta I didn’t feel too well. Had heartburn. Didn’t feel too good throughout the whole evening and ended up going home early. Bummer! Thought we would drop by at the club for a drink. Hmm probably another time. I had an accident with hubs car earlier this week . It was really bad luck. I felt really bad cos I haven’t had any accidents for the past 10 years. When it happened the kids were in my sis and bro’s car. Thank God! If not I think it would definitely give them a fright. Hubs was on the way to Ipoh when the accident happened. I called him on the phone to tell him the bad news. He asked of the kids safety and mine. He didn’t scold me or comment anything at all …. that makes me feel even worse. Felt more like an idiot!! He’s a really understanding and supportive hub. I Love You! Today marks the 11th anniversary for us. We’ve been together actually that long … my! time really flies. And we’ve been married for 7 years. Oldest child had just turned 4. My .. my … time really flies! Of all those years, we’ve been celebrating WITHOUT the kids but this time round, the kids will be joining us. We went for dinner at this joint called Sincero suggested by dearest hubs … food was ok …. chocolate milk shake was good but the carrot milk tasted like water. I like the toilet tho …. so techie until I don’t even know how to use it … hahaha. After dinner, we took the kids golfing. What can be done on a romantic day like this with kids. Precisely! Nothing romantic. Many years have passed and many more to come! Happy Anniversary Darling! 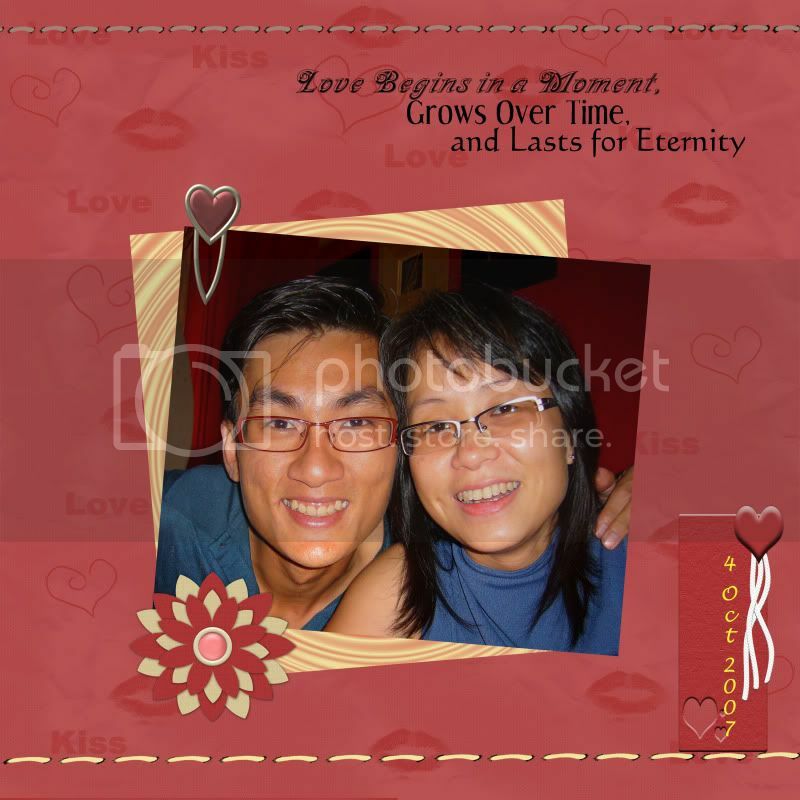 This is our 10th anniversary (courtship + marriage). Time really flies. We dropped the kids at nursery, we went to Korean Village in Ampang to have BBQ lunch. Everything there was Korean … supermarket sells korean stuff … even the saloon was owned by Koreans. Practically everything there is Korean. Since everyone is saying that the food there is cheap and nice so we decided to try. Its was good .. the marination was tasty and meat was also tender and juicy .. hmm yummy! After that, Mark decided to cut his hair and I washed too. The way they wash is really different. Washing hair while lying on a basin is something new to us. Normally its washing while you sit down and rinsing at the basin but this is totally different. Right after that, we stopped by a supermarket to get some biscuits and snacks for the kids. We decided to go for a spa at Great Eastern Mall. Its pampering and totally relaxing. Nice. When it was time, we went to pick up the kids and we went for dinner. 28 fireflies created this page in 0.126 seconds while sneaking quietly through warm places with it on their heads, completely undetected by anyone. All content © Mark & Twin.com all rights reserved. Powered by WordPress 4.3.19	and most likely invalid XHTML and	CSS. You may syndicate the output or specific entries using the following links: Entries (RSS) and Comments (RSS).